Gale Hull, center, president of Partners in Development, delivers loans to small business owners in December 2009. Join Anderson Cooper for "Hope for Haiti Now" a global telethon, 8 p.m. ET/PT Friday on CNN. 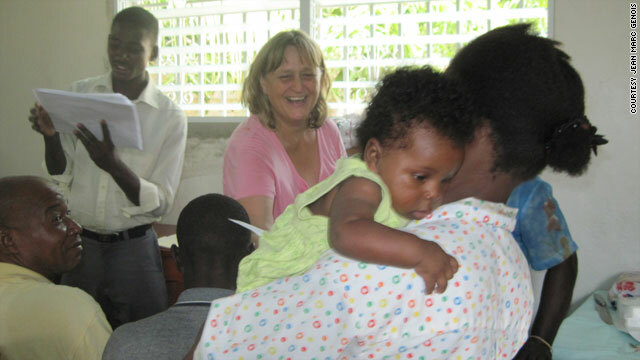 (CNN) -- Through treacherous floods and military coups, Gale Hull's organization Partners in Development has provided medical services to Haiti's poor. The group's clinic is still standing despite the devastating 7.0-magnitude earthquake, but there's no medical team there. Hull is just one of thousands of people eager to get into Haiti to help, but whose efforts have been delayed by communications outages and the country's crumbled infrastructure. "It just breaks my heart that I can't tell anybody" at the clinic, she said. "Even if you could just call them and say, 'I'm coming as soon as I can. I'll find a way to get there,' but you can't even do that," she said. Doctors Without Borders has also had obstacles getting supplies to Haiti. Since Thursday, five of the group's planes have been diverted from Port-au-Prince to the Dominican Republic, the group said Tuesday. Even a 48-hour delay of supplies to Haiti could result in hundreds of people dying, Benoit Leduc, the group's Haiti operations manager, said Monday. Meanwhile, although the nursing union National Nurses United has amassed a list of more than 11,000 volunteers, none had been deployed as of Tuesday, nurse and spokeswoman Liz Jacobs said. "I'm a registered nurse. I'm ready to go. Frustration is definitely the word of the moment," she said. "I know we're not alone in that." 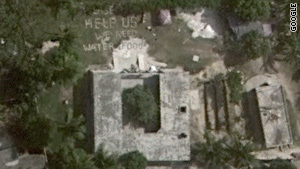 A Google Maps satellite view of the Partners in Development clinic reveals a plea for food and water written in the sand. Jacobs said the nurses' group, an affiliate of the California Nurses Association / National Nurses Organizing Committee, screened hundreds of potential volunteers and had planned to send some aboard the USNS Comfort, a naval hospital ship. But the group was then told that it could not send volunteers. "While we appreciate all the offers of assistance, due to the compressed timeline, and the need to activate medical personnel with only two days' notice, the decision was made to begin the mission with military professionals who were most familiar with the USNS Comfort," an official from the Navy's Bureau of Medicine said. The Navy is working with several nongovernmental organizations to augment the longer-term plan for medical assistance for quake victims, the official said. On Wednesday, the Comfort had arrived in Port-au-Prince and had begun treating patients. Project HOPE, a nongovernmental organization with a longstanding relationship with the Navy, has sent three members aboard the Comfort, said Rand Walton, the group's spokesman. The goal is to start incorporating the volunteers into the organizational structure in the next seven days to two weeks, U.S. Navy Cmdr. Mark Marino said in a conference call Tuesday. Hull, who will fly to the Dominican Republic on Saturday and try to get to Haiti from there, has been told by people in Haiti that there are hundreds of people at her clinic -- in a part of Port-au-Prince called Blanchard -- praying and using the building's open space for sleeping. "At least they know that with every single thing that's happened, we always come," she said. "At least they have that hope." It took Hull two days after the earthquake to get in touch with even one staff person involved in Partners in Development in Haiti. She finally reached the Haitian nurse who normally works at the clinic, who said that many relatives and friends had died and that because of her broken leg, she cannot go to the clinic. Hull knows that her staff is alive and that the families the group helps in one area of the country are, too. But in another area, there's still no word. Hull founded the nonprofit Partners in Development with her husband in 1990. The organization, whose office is in Ipswich, Massachusetts, where Hull lives, does most of its work in Haiti and Guatemala, and seeks to help the most extreme poor by building homes, sponsoring children, delivering medical care and giving loans to small businesses. She usually goes to Haiti every six weeks to check on the projects. The organization was founded as a Christian service organization, as Hull's belief as a Christian in helping the less fortunate originally inspired her to do this work. "I believe that we are called to help the poor," she said. Nearly 100 medical personnel, including doctors and nurses, have volunteered to go with Partners in Development as part of relief efforts for the victims of the Haiti earthquake. The goal is to bring in a team of medical workers and translators, let them stay for one week, and then rotate them out, with these rotations going for the next several months, she said. "It's dangerous for right now, we're into security, but it's also going to be really emotionally difficult for the people who go there," she said. Security is such an issue that Hull has ruled out trying to distribute food when she gets her first post-quake team to Haiti. When the group tried to give out food in the past, chaos erupted in the crowds of people desperate to get something to eat. "If you have a line of people, they start to crush forward because they're afraid you're going to run out of food before you get to them, so they start to like push and push, and then they're pushing everybody, and you are literally trying to scoop kids out of the crowd," she said. "It's one of the scariest things." Ideally, there would be a central distribution center that serves hundreds of families, she said. One thing that has worked for Partners in Development is to put up notices about food distribution and tell people to come with their own bags. Having everyone come and go with the same bag makes the situation safer for them, as they are less likely to get robbed, Hull said. Hull recommends that anyone who wants to go to Haiti to help out with earthquake relief find an organization that will provide food, water, shelter and security. "You should not try to go as an individual," she said. "When you get there, there are no resources similar to what you are used to in the U.S."
Dr. Paul Biddinger, an emergency medicine physician at Massachusetts General Hospital who is going to Haiti with the Project HOPE group, agreed. He also said that as he was getting his shots Friday, he was already making friends with others on the team. "There's a tremendous camaraderie that happens when people respond to a tragedy like this," said Biddinger, who also assisted during Hurricane Katrina in 2005. "Back then, as now, these projects bring together people who haven't worked together, and very quickly you make bonds." Liz Jacobs, who is also planning to go to Haiti, said her group of nurses has learned through other natural disasters to call a lot of clinics and not rely only on government entities. "Sometimes, you can't wait around for people to ask for the help," she said. A good disaster relief volunteer must be self-reliant, understand risks and be able to react quickly, said Curt Welling, president of AmeriCares, whose first airlift of medical aid arrived in Haiti on Sunday. In any chaotic environment, the plan can change every half-hour, and you have to be able to adjust accordingly, he said. For more places to contribute to the Haiti relief effort, check out CNN's Impact Your World.